Today we have the treat of hearing from paleontologist, Susan Drymala! Susan Drymala is a graduate student in vertebrate paleontology at North Carolina State University (now working towards her PhD) and the North Carolina Museum of Natural Sciences. Susan has a BS in geology from the University of Maryland and a MS from NCSU. 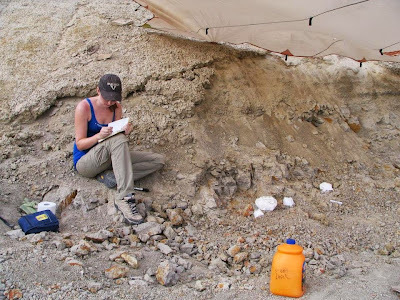 She took a brief hiatus from academia between her BS and MS due to illness and ended up working for an aggregate mining company for a year and began the blog The Forgotten Archosaurs. 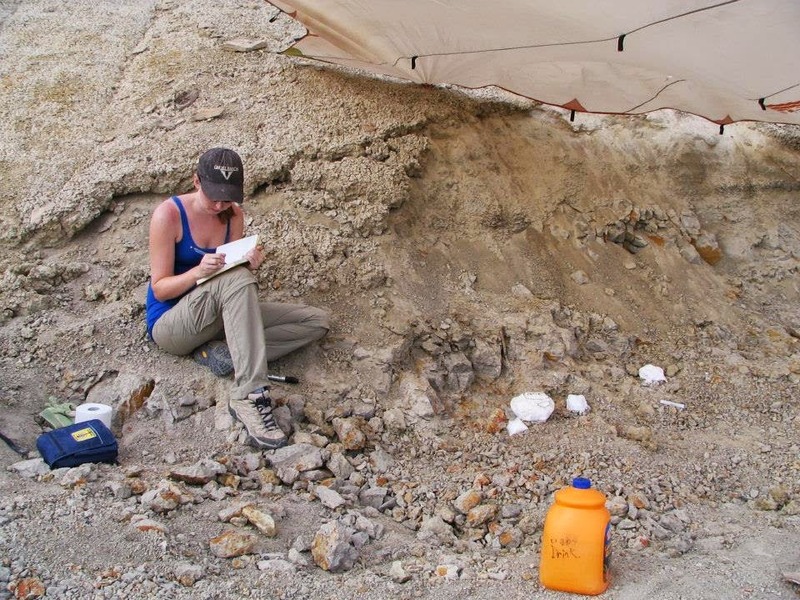 Susan studies crocodile-line archosaurs (pseudosuchians), specifically Paracrocodylomorpha, and terrestrial ecosystems of the Triassic. She has done field work in the Triassic of Arizona, New Mexico, Maryland, and North Carolina and the Cretaceous of Utah and recently named a new species of large crocodylomorph. Question 1: Who did you admire growing up? SD: I actually don’t remember having any major role models while growing up, other than the occasional teacher. I was a pretty shy kid. Question 2: At what age did you get inspired to pursue a career in paleontology? SD: I knew quite early on that I wanted a career in the natural sciences. I vividly remember visiting places like Yellowstone National Park and Dinosaur National Monument at age 5 and hanging on every word of the park rangers. I pretty much always envisioned a career in geology or biology and things slowly solidified over the years until sometime in high school when I was quite certain that paleontology was definitely the path I wanted to take. Question 3: You are best known for working with pseudosuchians (as oppose to dinosaurs) from the Triassic. Was this a part of the field that you had more interest in before you started research, or did the research choose you? SD: When I started to really pursue paleontology as a possible career, there two things that I was certain of: I wanted to work on animals that were unusual/ poorly understood and I was really interested in mass extinctions. I DID NOT want to do Dinosaurs, since it seemed like everyone was working on them and I figured that there must be a lot of other cool critters that were even more mysterious out there to be studied. I knew that I didn’t want to do anything with humans, which for me meant that mammals were out of the question too; they’re too recent and too familiar. I wanted to explore further back in time. By the time I was a freshman at the University of Maryland, taking Historical Geology with Tom Holtz, my interest in extinction events and the less familiar side of paleontology brought my attention to the Triassic and to the pseudosuchians that dominated that time. Question 4: What was your favorite prehistoric animal growing up? Which is your favorite now? SD: I never really had a particular favorite of much of anything while growing up. I’ve always been drawn to big predators though, so I’ve always liked big cats and theropods. Once I started reading about pseudosuchians, I was immediately drawn to the “rauisuchians”. I’m still not sure I have a favorite per se, but since my MS thesis and first publication were all about Carnufex, it will always hold a special place in my heart. Life reconstruction of the pseudosuchian, Carnufex, by Christopher DiPiazza. Question 5: Paleontology is such a diverse field these days involving many disciplines. What advice would you give to an aspiring paleontologist today? 1.) Are you a researcher? A lot of aspiring paleontologists don’t realize just how many different career paths you can take and still work in paleontology. And not all of them require a PhD. Sure, lots of paleontologists are professors and curators, but there are also preparators, collections managers, and paleo artists, to name just a few, and all require different skill sets and very different career paths. It’s important to get to know the field of paleontology as a whole before deciding on a career. 2.) What do you want to study? Don’t just say “T. rex”. If you are a researcher – if you’ve got a lot of questions and ideas on how to answer them - there are three things to think about as far as area of study: time period, taxon, and methodology. If you want to go into research, you’ll need to choose a specific field from each of these areas. For example, I study the phylogenetics and paleoecology (methodology) of Triassic (time period) paracrocodylomorphs (taxon). You don’t have to choose just one topic per area and you can certainly focus more on one area than the other – plenty of paleontologists focus almost entirely on a certain methodology and will apply it to pretty much any taxon, while other will apply a whole host of methods to understand one particular taxon – but all three are important for budding paleontologists to consider. 3.) In paleontology, you need to be both the jack of all trades (in order to land a job) and the foremost expert in one narrow field (to remain relevant as a researcher). Well trained paleontologists are employed in all sorts of areas, from teaching med school anatomy to managing the geological resources at a national park. Having a good understanding of a lot of different areas of study keeps you marketable but also makes you a better scientist, since you’ll have more tools to approach research questions with. I’ve made sure to get a good education in both geology AND biology for this reason. Being an expert in one area is also important though, because it makes the “foremost expert” in something, which means other scientists will come to you on that topic. Question 6: Going to college these days and then on to grad school has become a daunting task. Many people are unaware of how long it takes to make it to the finish line. The rewards are great, but what would you say to someone pursuing professional studies after college? SD: The question of “are you a researcher” that I discussed in the last question is really important here. There are plenty of ways into paleontology that do not require advanced degrees. Becoming a fossil preparator, collections manager, museum display designer, or paleo artist does not necessarily require a PhD. If you do want to go the academic route though, it is important to have those qualities of a researcher, that “spark” of inquiry and imagination found in a good scientist, but also a lot of energy. The road through grad school is hard and you have to learn a lot more just how to do good science. Like I said, you’ve got to be a jack of all trades. 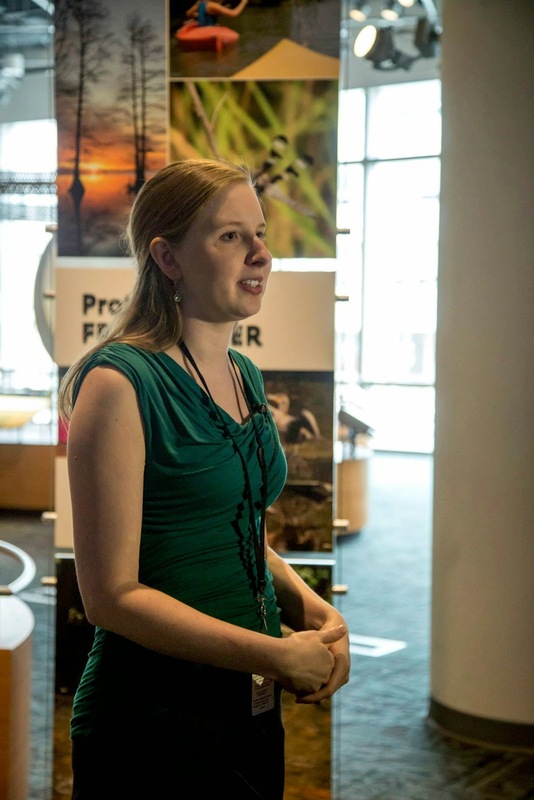 You’ve got to learn a lot of different sciences, but also a lot of other skills, like scientific communication (from writing scientific literature and grants to public outreach). Question 7: What was or is your favorite project? Would you be able to tell us about some of your current projects? SD: Carnufex has been my baby for the last 3 years. I’ve really enjoyed working on this animal because it really is helping to make sense out of the various carnivorous pseudosuchians of the Triassic. Because of Carnufex, I’ve been working pretty heavily on the phylogenetics and evolution of that area of the pseudosuchian tree. I’m hoping to have a new paracrocodylomorph tree out in the next year or two and I’ll definitely be talking about some of the modifications within the basal crocodylomorph part of the tree at SVP. Question 9: Do you ever get criticized on any of your work? How do you handle it? SD: So far, I haven’t had any major criticisms of my science. I’ve been pretty fortunate to have some pretty big names as mentors and I’ve got a lot of great people rooting for me. I’m sure that once I get more of my phylogenetic work out there I might start to stir some things up, but that tends to happen a lot with phylogenetics. I generally just try to remind people of what the science says and how science works; I’m putting hypotheses out there and the data that’s available to support it, that’s all. I really think that it’s important to not let things get personal in science. People are equal; ideas are not. If the data doesn’t support a hypothesis, we should let go of that hypothesis. Some people did react somewhat negatively to the implication that Carnufex might have been bipedal and there are two things that I’ve tried to address with this: (1) we never explicitly said that Carnufex was bipedal, but the media seems to have taken the artists reconstruction (which is more of a rearing pose than true bipedality) and ran with it, but also (2) we haven’t explicitly ruled out that Carnufex was bipedal because it’s not outside the realm of possibilities given the large skull, short forelimb, and the fact that plenty of other Triassic paracrocs were likely bipedal. I just try to remind people of what the science says, and what it doesn’t. With the recent publicity of Carnufex, I’ve gotten a little bit of personal criticism, especially focused on my voice, which has been very interesting. When it comes to personal attacks, I generally prefer to not “feed the troll” and just turn the other cheek. However, I also don’t tolerate bullies and especially not those perpetuating negative stereotypes, so I will sometime respond to negative criticism, but I always try to stay civil. And fortunately, as I learned on Twitter recently, there are a lot of great paleontologists out there on social media willing to back me up. Question 10: Jurassic Park and Land Before Time (opposite ends of the spectrum I know) were the movies I remember as a kid that fueled my passion for dinosaurs. What was your most memorable movie, book or TV program that inspired you with regards to paleontology? SD: I think that we probably grew up in the golden age for dinosaurs in the media. Not only did the late 80s and early 90s have some great dino movies (Jurassic Park, the Land Before Time, We’re Back! A Dinosaur’s Story, Prehysteria!) and TV shows (Dinosaurs, of course), but the Discovery Channel was also still showing real documentaries then too. Walking with Dinosaurs and the other associated documentaries were great to have around as I considered a career in paleo. I think all of these had a bit of a snowball effect on me. Question 11: I remember meeting my first professional paleontologist. Do you remember the first paleontologist you ever met? Were you a nervous wreck? SD: I remember emailing Matt Carrano when I was in high school and thinking about becoming a paleontologist. I was so excited to get a reply. I kept a pint-out of that email for years. My next real encounter with a “real” paleontologist was when I met Tom Holtz at an open house for University of Maryland. At first I was nervous, but he was such a nice and energetic person who I had so much in common with that we became pretty fast friends and the nerve went right out the door. I still get a little nervous when I meet some of the big names in paleontology. Even though I know I shouldn’t, it’s hard to not get a little nervous when you’ve seen these people on TV and you know that they’re such an important part of the community. I tend to be a shy person anyway. Question 12: Dinosaurs and the animals that lived at the same time as them were amazing creatures. Why do you feel they continue to fascinate us? SD: From my own experience, I think that they speak to the innate explorer in all of us. Our imaginations love the unfamiliar and the prospect of discovery. And in a time when our world seems to be shrinking, prehistoric creatures remind us that there are still new things out there to be discovered. Paleontology is currently the only form of time travel. Question 13: What is your favorite time period? SD: I adore the Triassic. I could probably gush about it for hours. It begins and ends with two of the biggest mass extinctions of all time. It’s the time of Pangea, the only time in the history of life on land that all the continents were connected. It is a time when the holdovers of the ancient Paleozoic ecosystems (like synapsids, temnospondyls, and cycads) are still abundant and when most of the modern clades we are familiar with first appear, including turtles, mammals, and archosaurs. It’s a time when dinosaurs are around, but they have not risen to dominance yet. It’s the time of the pseudosuchians. SD: I certainly adore science to no end, and although I don’t have much time for hobbies these days, I am fortunate that a lot of my hobbies are related to paleontology. Most of my hobbies involve travel, the outdoors, and art (of varying types). I get outdoors as much as possible to hike, camp, or rock climb (although I don’t have much time these days except for when doing field work). I’ve been to the 48 contiguous United States, 7 foreign countries, 5 tectonic plates, 3 hot-spot volcanoes, and a whole host of national parks and monuments. I enjoy just about all forms of art and have engaged in almost all except for music and the performing arts. I used to do a lot of painting with acrylics and oil paints, but have shifted to focus mostly on drawing. I also really enjoy sculpture and sewing. One of Susan's acrylic paintings. 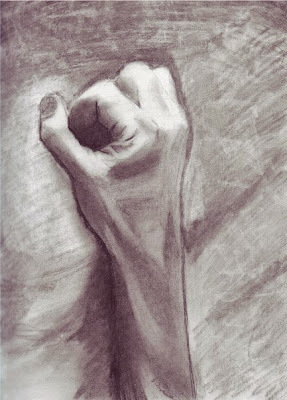 One of Susan's graphite sketches. Question 15: Have you ever been to New Jersey? SD: Being from Maryland originally, I’ve been to NJ a number of times. Most of my experiences with the Garden State have involved to turnpike, but as an undergrad at UMD, I helped organize a geology club trip to the Franklin mine to collect minerals and we camped in a nearby state park, which was beautiful. It was a really great trip. Thank you, Susan! To learn more, please check out her website, the forgotten archosaurs, and follow her on twitter. Farewell until next time!